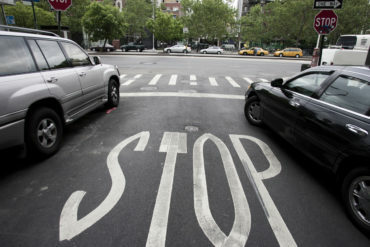 A recent Supreme Court of Canada decision means the City of Hamilton is partly liable in a motor vehicle bodily injury lawsuit because there was no painted stop line immediately before an intersection. On June 16, 2007, a vehicle driven by Dawn Safranyos was T-boned by a vehicle driven north on Upper Centennial Parkway by Daryl McHugh. Safranyos had pulled into the intersection to turn left into the southbound lanes of Upper Centennial Parkway from Green Mountain Road. The intersection was a two-way stop, with traffic along Upper Centennial Parkway having the right of way. Safranyos had been stopped on Green Mountain Road facing west. Four occupants of the Safranyos vehicle were injured. Initially, as a result of a trial, Safranyos was found 50% liable. McHugh and the City of Hamilton were found 25% liable each. The scope of the trial was on who was at fault, not on the amount owed in damages. The City of Hamilton was found contributorily negligent because the stop line that normally would have been on Green Mountain Road immediately east of the intersection had been removed. The City was unsuccessful on appeal to the Court of Appeal for Ontario. The Supreme Court of Canada announced April 4, 2019 it will not hear an appeal from the City of Hamilton in City of Hamilton, et al. v. Madeline Smith, et al. In her 2016 ruling on liability, trial judge Kim Carpenter-Gunn of the Ontario Superior Court of Justice noted the stop sign on Green Mountain road was 10 metres behind the intersection. She concluded that Green Mountain Road was not in a reasonable state of repair. At the time of the accident, the road lacked a painted stop line immediately east of Upper Centennial Parkway. On appeal, the City of Hamilton argued that a reasonable driver would have stopped again immediately before entering the intersection. Safranyos had stopped at the stop sign, looked left once, and then rolled towards the intersection without stopping a second time, Justice David Paciocco of the Court of Appeal for Ontario wrote in its unanimous ruling. Although Safranyos was negligent, the city shares liability, the Court of Appeal for Ontario ruled. “If an intersection is rendered unsafe for ordinary or reasonable drivers in whole or in part because of the placement or condition of stop signs and road markings, a municipality cannot avoid liability by relying on Highway Traffic Act,” Justice Paciocco wrote. In its 54-page ruling, the Court of Appeal for Ontario also overturned the finding of liability against McHugh, who had the right of way. “Even if Mr. McHugh reacted more quickly than most ordinary drivers, in my view it is unrealistic to expect that he could have reacted and then taken effective action to avoid the collision, since he had nowhere to go,” wrote Justice Paciocco. The remaining defendants agreed to share liability with the city being a third liable and the driver being two-thirds liable, a lawyer for the plaintiffs told Canadian Underwriter April 8. At one point, Green Mountain Road did have a stop line painted immediately east of upper Centennial Parkway. That stop line was removed in a “shave and pave” in 2004.